This is a series of postcards that I did a few years ago on the long version of the Serenity Prayer. At that time in my life I had pared my prayers down to simply saying one word at a time. This was especially nice walking to work, since it was simple and I could pace the word with my steps. I would take action words from prayers that I said often and say these words as my prayer. Now, I love drawing birds and thought I might illustrate this prayer, or the primary words that I would pray, and find a bird to represent each word. Since I live in Illinois I used birds that are native to my home state. Then I wanted to find birds that would show humility and strength; not the birds that one would usually think of, like and eagle for courage. 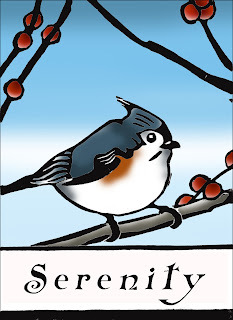 The first card, representing Serenity, is a Tufted Titmouse; small with muted colors I thought it looked very humble and at the same time has a strong presence. 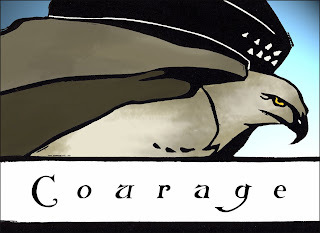 The second bird, Courage, is a Red Tailed Hawk; not as impressive as other raptures and very common, like all of us. 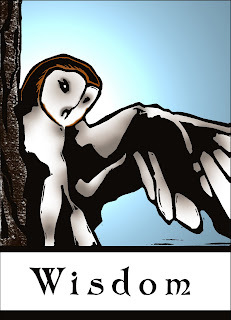 The third, Wisdom, is a Barn Owl; again, very unassuming and delicate. Each print was first made from a block print that was then scanned into a digital format and colorized on Photoshop. On the back of each card is a part of the Serenity Prayer, so they make a trilogy. You can find them in my little Etsy shop. I love these. They look like a bit of Art Deco mixed with some Victorian style. The idea of taking specific words from prayers and repeating them is a good one. Especially powerful with the Serenity Prayer. Works like an mantra or meditation. Hey hun! Thought I would let you know I received my gift from you today! Thank you so much! Stopping by through SITS to say hello! I love the Wisdom card! Owls are awesome! Those are gorgeous! You're very talented! WOW! Those are beautiful! You are very, very talented. Those are really good...beautiful! And I love your explanations of them, too.